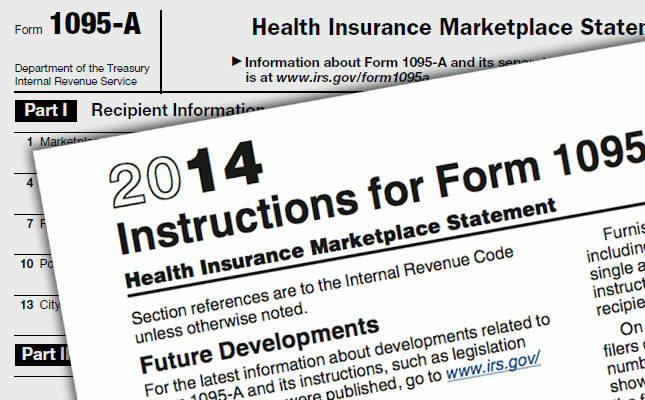 Starting 2014 filing season, for the first time, a client who enrolled in health care coverage through the federal marketplace or a state marketplace will receive one or more Forms 1095-A. If you or anyone in your household enrolled in a health plan through the Health Insurance Marketplace in 2014, you’ll get Form 1095-A, Health Insurance Marketplace Statement. You will use the information from the form to calculate the amount of your premium tax credit (PTC) and reconcile advance payments of the premium tax credit made on your behalf to your insurance provider with the premium tax credit you are claiming on your tax return. To do this you will use Form 8962 – Premium Tax Credit, which you file with your tax return. You will get Form 1095-A from the Marketplace, not the IRS. Zaher Fallahi, Tax Attorney and CPA. You should receive Form 1095-A in the mail from your Marketplace by early February. If you purchased coverage through the federally facilitated Marketplace and you set-up a HealthCare.gov account, you can get a copy of Form 1095-A, Health Insurance Marketplace Statement online from your account. If you purchased coverage through a state-based Marketplace, you may be able to get an electronic copy of Form 1095-A from your state-based Marketplace account. Visit your Marketplace’s website to find out the steps you need to follow to get a copy of your 1095-A online. If you do not receive your Form 1095-A by early February or you believe it is incorrect, you should contact the Marketplace from which you received coverage. You should wait to receive your Form 1095-A before filing your taxes. The form will tell you the dates of coverage, total amount of the monthly premiums for your insurance plan, the second lowest cost silver plan premium that you may use to determine the amount of your premium tax credit, and amounts of advance payments of the premium tax credit. Enter the information from Form 1095-A on Form 8962 to claim the premium tax credit or to reconcile advance payments of the premium tax credit on your client’s tax return. Zaher Fallahi, Tax Attorney and CPA, practices as Los Angeles Tax Defense Attorney and Orange Tax Defense Attorney, and assists taxpayers including Americans Living Abroad and Non-Resident Aliens subject to the US tax law, in resolving their tax problems regarding their Offshore Voluntary Disclosure Program (OVDP), Report of Foreign Bank and Financial Accounts (FBAR), Foreign Account Tax Compliance Act (FATCA) and Foreign Trust.